Activist organization Animal Recovery Mission just delivered another stunning blow to the factory farming industry in Florida. Following close on the heels of its undercover dairy abuse videos, ARM released video evidence of terrible living conditions for chickens at a Cal-Maine Foods, Inc. farm in Lake Wales, Florida. Cal-Maine is the largest “shell egg” producer in the United States. Its eggs are marketed as Egg-Land’s Best and Land O’ Lakes brands. Under the branding of Farmhouse and 4-Grain, Cal-Maine also sells organic, vegetarian-fed “cage-free” eggs. ARM’s three-week undercover investigation revealed that thousands of laying hens are crammed 10-deep into battery cages, leaving them no space to move around or spread their wings. 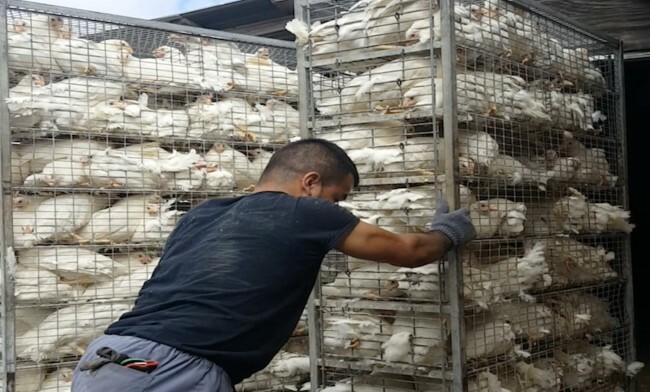 There, according to ARM, they die at a rate of 100 to 900 a day of dehydration, starvation, strangulation, trampling and egg binding — when an egg becomes stuck inside the reproductive system. The investigator “also witnessed extreme abuse and torture to the hens, who were kicked, punched, thrown, slammed against the ground, beaten to death with sticks, pulled apart alive, and jammed in cage doors where they suffered agonizing deaths from being crushed,” said an ARM news release. 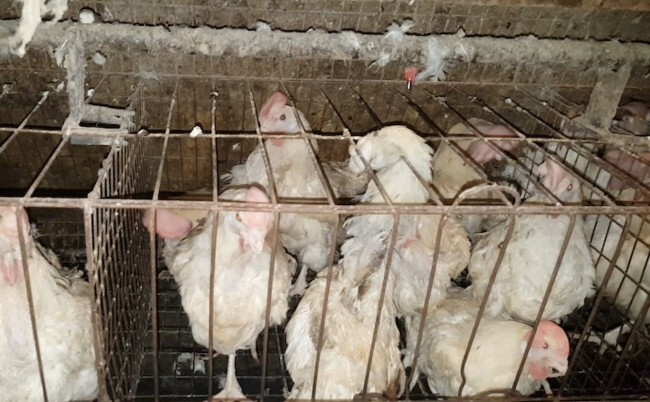 Florida, if you buy eggs at Publix or Walmart, these are the conditions in which the hens live. Remember this video at breakfast tomorrow morning. Every time you have an egg, you’re eating the misery and sadness of thousands and thousands of trapped, tortured birds. The video depicts another employee deliberately mistreating a hen, and that employee was immediately terminated. Once the video was presented to us, we cooperated with the local sheriff’s department and officials from the Florida Department of Agriculture and Consumer Services in their investigation, and we provided them access to the Lake Wales facility. They reported they did not find comparable conditions to what was shown on the video. We believe that this was an isolated incident and does not reflect the ethical standards of animal care expected of all Cal-Maine Foods employees. Further, we continue to work with our animal welfare team to prevent this from happening in the future. You do that, Cal-Maine. Get your “animal welfare” team right on that. While you’re at it, come up with a kinder way to house your hens, because 10 hens to a battery cages isn’t the answer. 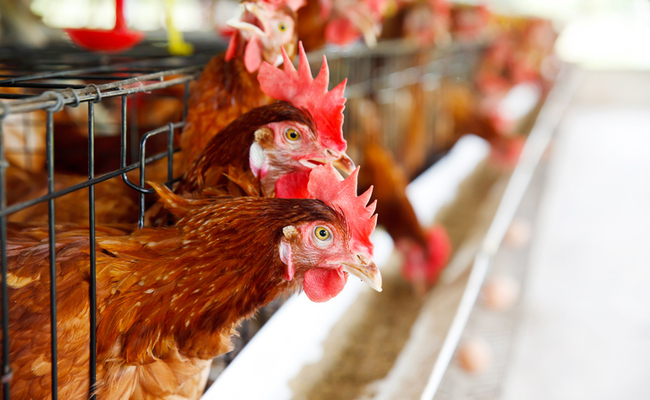 ARM believes that Florida politicians prop up the state’s egg industry by supporting the continued use of battery cages. Did you know that Florida State Senator Wilton Simpson owns Simpson Farms, an “independently owned and operated contract producer for Cal-Maine Foods.” Interesting, isn’t it? ARM may be on to something. Sen. Simpson took pains to remind the press that the term “battery cage” refers simply to how the cages are arranged. That’s true, senator. It’s not the name animal protectors find objectionable. It’s the appalling 67 to 76 square inches of space given to each hen inside a battery cage to live out her pathetic life. A standard sheet of paper measures 94 square inches. Do you understand the problem now? We do not tolerate the mistreatment of animals and we’re working with our suppliers to quickly and thoroughly investigate the actions shown in the video and to take the appropriate steps to help ensure this unacceptable behavior cannot continue. We take animal rights seriously and have strict policies in place to hold our suppliers accountable. Come on, Florida. It’s time to make battery cages illegal. Stuffing all those poor birds into cramped cages is morally wrong. Frankly, it’s time for a fundamental shift. Stop farming animals and begin feeding the world with plants. There are so many compelling reasons to do so. EVIL, EVIL, EVIL. I PRAY THAT GOD SOON BRINGS AN END TO SUCH EVIL FACTORY FARMING. THOSE WHO CREATED FACTORY FARMING SHOULD ALL GO TO HELL!!!!!! Thank you for letting us know about this tragic events, we appreciate you telling us about this, shame they are ruining the society around us. Overall thank you for sharing. Thank you for posting. Makes me glad I raise my own food...ethically.